The Greek Life organizations at Morningside are known to usually have friendly rivalries during Greek Week, but the Greeks put their differences aside during Homecoming Week to band together for a worthy cause. Morningside’s three Greek Life organizations came together this year to bring back the Stand Against Breast Cancer fundraiser that former Morningside fraternity Delta Sigma Phi started in 2008. The fundraiser entails someone standing on a wooden box outside of the Olsen Student Center 24 hours a day from the end of Into The Streets on Wednesday until game time on Saturday, where the box is moved down to the stadium where someone continues to stand. The goal is to help create awareness for breast cancer, and to raise money for breast cancer research. Morningside’s current Greek Life scene is made up of sorority Alpha Omicron Pi, and fraternities Phi Mu Alpha Sinfonia and Acacia. The project was a collaborative effort of the Greek Council and Bradley Davis of Phi Mu Alpha. Davis is a second year senior majoring in elementary education with an emphasis in special education. He joined Phi Mu Alpha in the spring of 2016 because he wanted to continue on the fundraiser after the disbanding of Delta Sigma Phi. He felt that it was a great cause and said, “I heard many complaints from alumni when there wasn’t a box during last year’s homecoming.” After hearing this, Davis was hard at work to help resurrect the fundraiser. He built a completely new box, which features the letters of the three organizations and paid tribute to Delta Sigma Phi. Davis even pitched the idea to the Greek Council, which he received universal support from representatives from the other Greek Organizations. Overall, 24 members across the three organizations participated in standing on the box. While they worked in shifts, not a moment between Wednesday afternoon and Saturday evening was spent without somebody standing on the box, even though there were rainy conditions throughout the week. By the end of the Football game Saturday, over $500 was raised for the June E. Lylen Cancer Center here in Sioux City. Davis said “Faculty and alumni enjoyed the return of the fundraiser.” He hopes that with more planning for next year, the Stand Against Breast Cancer fundraiser will be better than ever. On Monday, October 2nd, I spent a little more than an hour at a bar downtown known as The Marquee. Normally, I have no business hanging out a bar since I’m under 21 and I typically don’t drink, but this particular night I had a reason to be there. Local jazz band Reggie Shive Big Band was performing and as a man who is currently developing his taste in jazz, I couldn’t pass up on the opportunity to listen to some live local music. When myself and the group of friends I was with showed up, the band was not performing yet, so the place was generally quiet. The first thing that really struck me was the delicious smell of popcorn coming from the popcorn popper near the bar. As soon as I paid my cover charge, I immediately went over to the popper to get myself a snack before the show. The corn had a very rich, buttery taste, but it wasn’t an overwhelming taste that can sometimes happen with fresh popped corn like that. The first thing I noticed altogether about the place is that it is very music oriented. I knew before I came there that they had a stage for live music, but I never understood until I came there just how deep their music roots went. When taking my seat over by the stage, I saw to my right a massive mural of a Gibson Les Paul guitar on one of the walls. In addition, there were framed photos of many bands throughout the bar. This overall theme of music even extended to the drinks, as their signature drinks had music related names such as “Purple Rain” and “Green Day”. The joint really lit up once the 20 or so piece band began to play. Any noise of people talking was drowned out by the sweet yet loud jazz music being played by the band. Red stage lights illuminated the stage as the jazz band came to life. The first set the band played contained not only the well known Jazz standards, but they also played a couple newer pieces. A sweet waitress made sure my water cup and popcorn bowl was full throughout the show. A Long Standing Tradition Returns- 1st Draft. The Greek Life organizations at Morningside are known to usually have friendly rivalries throughout the year, they put their differences aside during Homecoming Week to band together for a worthy cause. Morningside’s three Greek Life organizations came together this year to bring back the Stand Against Breast Cancer fundraiser that former Morningside fraternity Delta Sigma Phi started in 2008. The fundraiser entails someone standing on a wooden box outside of the Olsen Student Center 24 hours a day from the end of Into The Streets on Wednesday until game time on Saturday, where the box is moved down to the stadium where someone continues to stand. The goal is to help create awareness for breast cancer, and to raise money for breast cancer research. Morningside’s current Greek Life scene is made up of sorority Alpha Omicron Pi, and fraternities Phi Mu Alpha Sinfonia and Acacia. The project was a collaborative effort of the Greek Council and Bradley Davis of Phi Mu Alpha. Bradley is a 2nd year senior majoring in Elementary Education with and emphasis in Special Education. He join Phi Mu Alpha in the spring of 2016 because he wanted to continue on the fundraiser after the dismantling of Delta Sigma Phi. 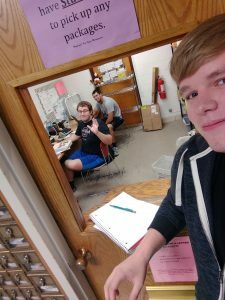 He felt that it was a great cause and said, “I heard many complaints from alumni when there wasn’t a box during last year’s homecoming.” After hearing this, Davis was hard at work to help resurrect the fundraiser. He built a completely new box, which features the letters of the three organizations and paid tribute to Delta Sigma Phi. He also pitched the idea to the Greek Council and got the organizations to participate in the project. By the end of the Football game Saturday, over $500 was raised for the June E. Lylen Cancer Center here in Sioux City. Davis says “faculty and alumni enjoyed the return of the fundraiser.” He hopes that with more planning for next year, the Stand Against Breast Cancer fundraiser will be better than ever.